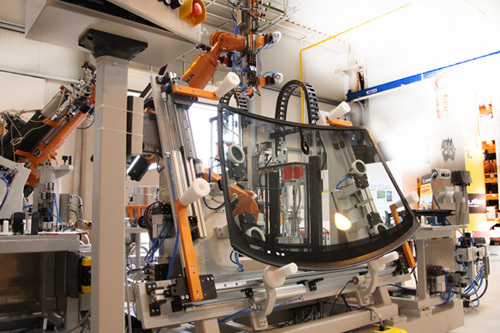 From individual applications up to fully automated glazing - glass fitting robots. 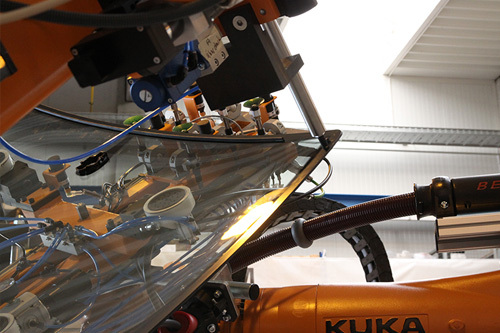 Whether it is for individual applications or for use as an adhesive technology supplier for complex automated systems for OEM’s – you can obtain a wide spectrum of adhesive and primer application technology from us. 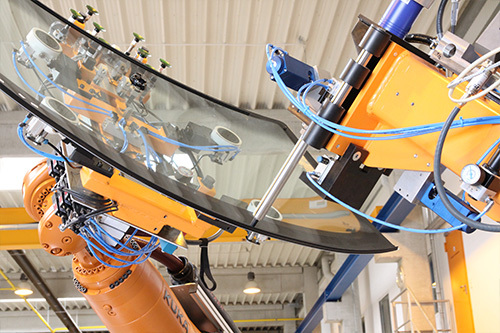 You can find our systems for applying primers and adhesives for a wide range of windscreen and roof modules all over the world in the manufacturing of passenger and commercial vehicles and buses. 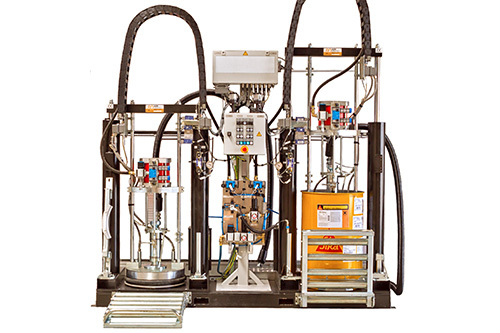 The adhesive application systems generally consist of a pumping system, dosing devices (electronic dispensing pumps or gear pumps), application valves and application heads. To guarantee that manufacturing can start quickly at the installation location within a few days, we build the complete system in our factory on a stable base frame in advance and put it into operation. The adhesive units will be laid out according to their eventual application. 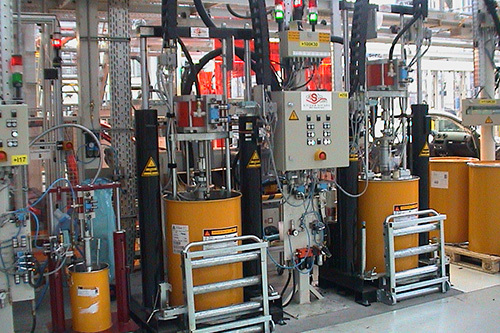 Important criteria in determining the layout are, for example, the viscosity, whether it is manual or automatic application, whether cold or warm adhesive processing is to be carried out, whether 1-component or 2-component adhesives are to be used and a variety of application procedures. 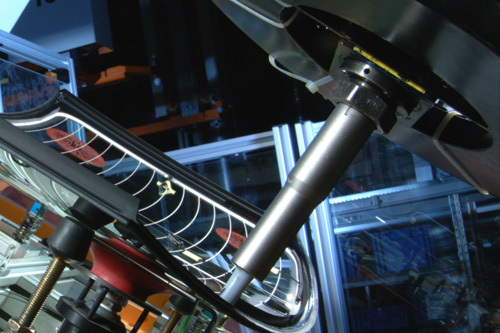 Manual application systems are designed in accordance with the requirements of the customer and taking account of the packaging sizes that are to be processed. Additionally, the decision on the type of pump to be used (scoop piston pumps, ball valve piston pumps, spiral pumps, gear pumps, diaphragm pumps and combinations of different types of pumps) will depend upon the type of adhesive that is to be used and the dosing requirements. Here, the drive type can be either pneumatic, hydraulic or electric. The processing temperature of the adhesive can range from room temperature up to 200 degrees Celsius. With each application system, there is a material hose (heated, when necessary) that is customized especially for each customer to the length required for the application. 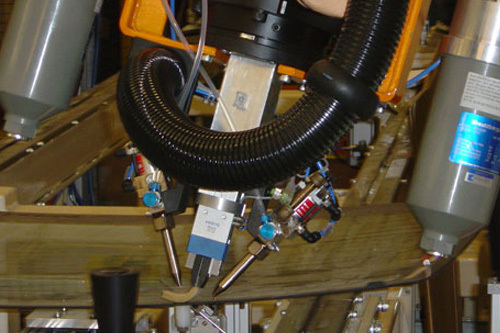 The application gun that is to be used by the operator has an appropriate application head for each different type of application (caterpillar, airless, swirl spraying, wide slot and flatstream). 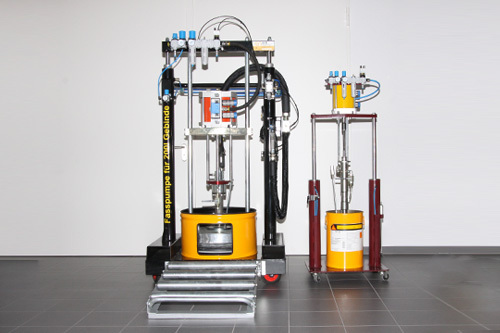 Automatic cleaning and primer application units with industrial robots. 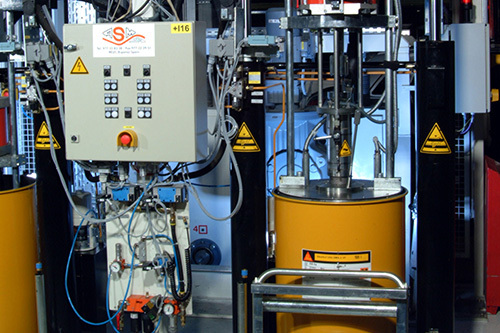 With this, a disc is cleansed and then primered using a special technology before the PU application. The cleaning is conducted with felt featuring an automatic delivery, a special brush or a spraying device. As such, the disc surface is immediately cleansed and primered right before the adhesive application and assembly in the vehicle. 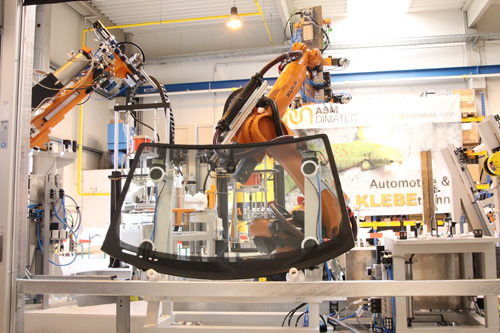 This automatic technology is especially interesting for manufacturers of automobile glass panes that are delivered to the final assembly lines pre-produced.